The Moiré Collection, a series of broadloom and modular floorcovering, draws inspiration from artist Gabriel Dawe’s innovative work with embroidery thread. 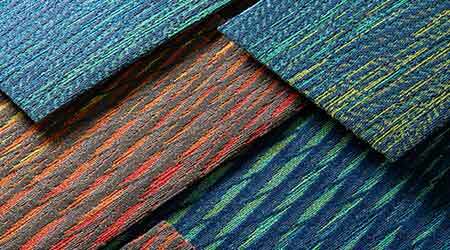 The Moiré Collection was inspired by Dawe’s work where miles of colorful threads are configured into forms that result in unique planes of depth, filled with rays of light. In textile or print design, moiré is described as a wavy or rippled textured effect where sets of lines or dots are superimposed upon one another creating sets of patterns differing in size and spacing. Similarly, The Moiré Collection celebrates the visual effect of its namesake. Offered in broadloom and modular plank constructions, the collection features replicated lines and forms that interact and change in color gradation and depth as the viewer’s perspective changes. The Moiré Collection has three styles: Pure Wavelength offers a large-scale study of moiré patterns, presented in modular plank resulting in a light- and color-filled dimension with layered, intersecting lines. Visible Light, available in broadloom and modular plank, deconstructs the moiré effect into a mix of fragmented lines, stippling and scattered color to product a soft, organic pattern option. Ray Tracing, deconstructs a sequential color gradient into striated color bands to form a playful, open pattern. For this modular plank style, moments of pattern appear and disappear. Available colorways in The Moiré Collection include red-orange, blue-green and purple-indigo color families as well as a few neutral companions. A “full-spectrum” colorway has been included that speaks to Dawe’s signature use of color and light in his work. The unique quality of light in Dawe’s work is also captured by a special treatment of high-luster yarn, which creates light within the carpet designs. The mix of luster levels brings colors to life with momentary glimpses of sheen that heighten the palette and enhance the sense of dimension found in the patterns.